Completely new designed INFO screen on camera’s rear display. In PLAY mode the last zoom position is now stored. When you reenter the PLAY mode and go to 100% zoom (by a long push of the rear click dial) the last zoom position will be used which provides a very quick and easy focus check on the relevant part of the image. Depth of field information on camera’s top display now available in feet (ft); and can be deactivated. Viewfinder information display now shows real-time buffer information when pressing first step of the shutter release button. “PC” icon on camera’s top display when camera is connected to the computer via USB 3.0 super speed cable. Remaining recording time shown on camera’s top display when camera is in Live View or Video Record mode. Mirror up icon on camera’s rear display when mirror up is in use. Reduction of the camera start-up time when GPS is activated in the geographic region of Iceland. 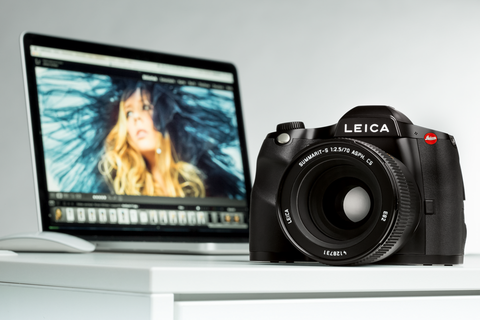 Latest Leica S lens firmware is included which is mandatory for the use of Leica S lenses with Leica SL (Typ 601) via Leica S-Adapter L.